BEWARE of FX Revenge, it's a scam! This review of FX Revenge shows why you should not trade with this system. It is presented by Dollar Bob. 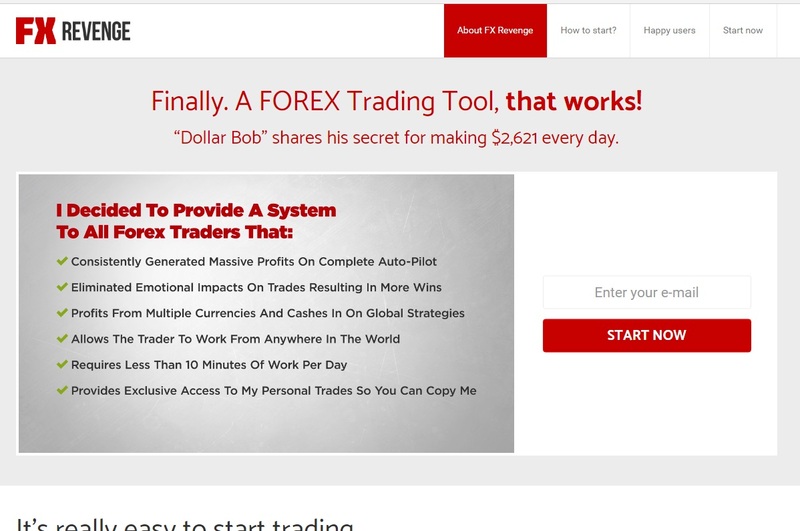 Dollar Bob says that he has a Forex trading system that can make you $2,621 per day. But it still is about binary options, not about Forex as the name would suggest. The FX revenge scam has the same basis as all the binary options scams that we have reviewed so far. A kind guy wants you to give a free income. Here is the proof. On the FX Revenge you will see testimonials with people who are claiming that they make money with this system. But they are liars. Just look at the picture to see a proof. This guy is a Fiverr actor, anybody can hire him for a fake testimonial for five dollars. We wanted to test the FX Revenge system to see how it really works, but after registering we were redirected to a deposit page of the broker Toroption. So in the end we found out what we were looking for. Because this explains how FX Revenge works. People who created it earn affiliate commissions for referring new depositors to Toroption, which is an unregulated binary options broker. That’s all. The rest of the story is just a fairy tale about a profitable robot. They need you to deposit money, this what it is about. Their robot is very probably a piece of crap that will lose your deposit. FX Revenge is an obvious scam that wants you to deposit money with a selected broker to earn a commission to people who run it. Don’t expect the robot to earn you anything, you will be losing your deposit! Trading should always be started on a demo account with a regulated broker. Use the demo to learn to trade profitably. Free robots are scams that will never make you any money. Thank you for your feed back. I almost signed up for this, but a little voice in my head kept saying it’s a scam. So I googled it and sure enough this website popped up. Thank you for stopping me from making a costly mistake. I thank you too! I also felt like Annette and decided to Google it as this world has more scams lately than legitimate sites. It just sounded too good to be TRUE! It is hateful to know there are so many ruthless scams around taking most of the jobless peoples last bit of money too….they are equal to drug dealers, human traffickers and pimps! Real sign of the end of this system of things! Thank you John, I spoke with the person called Jason and i gave him my card number, how do I stop because they could not get the money on my card and he asked me to call my bank to open online banking and i said ok. But something came up in my mind why are they going to my account because I told them that there is no money on my account. Hi, if you gave him your card number, I suggest blocking your card with your bank, because these scammers could steal your money. I spoke wit a bunch of looser, told them not to call me back, but they dont stop. Now they have my email adresse. Hi, the only thing that works for me is blocking their addresses and phone numbers. On an e-mail account filters can usually be created to block incoming e-mails from certain addresses (or containing specific words etc.). In my Android phone there is an option to automatically block an incoming call from any phone number I want. Scammers might change email addresses and phone numbers a few times, so you will have to create new filters each time, but in my case it doesn’t happen too often. That’s how I get rid of them. thank you for doing this kind of research. You save me for wasting my time and money.